One of the main concerns parents have about Minecraft is that their kid seems irresistibly drawn to the endless supply of Minecraft “Let’s Play” videos on YouTube. These videos are very popular because they teach Minecraft playing skills and can fire the player’s imagination. They’re great for those times when you’ve run out of ideas for things to build or do. How can you make sure that the “Let’s Play” videos your child watches are safe for them? While the public, uncensored nature of YouTube means it’s never possible to eliminate every single swear word and unsavoury moment, some YouTubers are a lot more family-friendly than others, and make an effort to keep the “grown-up” content to a minimum. To that end, here is the Brightpips list of fun, family-friendly, non-violent, mostly non-sweary Minecraft channels! At the end of the article, you’ll also find some tips on how to keep all of your kid’s YouTube viewing as safe as possible. Stampy — also known as stampylonghead or, if you want to be more conventional, Joseph Garrett — runs one of the most popular kid-friendly YouTube channels for Minecraft Let’s Play videos. Stampy is a firm favourite among kids, thanks to his lively, entertaining commentary and imaginative creations. 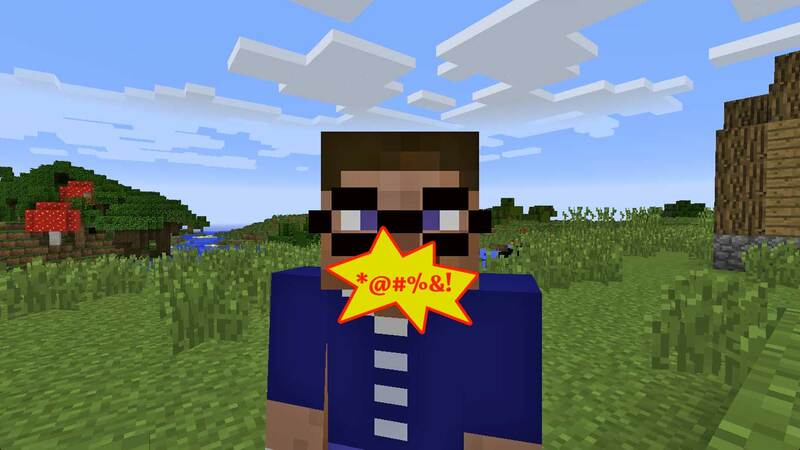 You need to be a little careful here, because Stampy did drop some F-bombs in his early “Stampy’s Lovely World” videos. However, he quickly realised that a lot of kids were following his videos, so as of Episode 19 he stopped using bad swear words, and even created a “swear chest” to keep himself honest! Stampy is also in the process of setting up a new Minecraft educational channel, which should be worth watching. Also, Stampy’s buddy iBallisticSquid is worth checking out. Long-running popular YouTuber paulsoaresjr produces a range of entertaining and humorous Minecraft Let’s Play video series, including Minecraft Dad, where he plays the game with his family. He also publishes Let’s Play videos for other popular games such as Terraria and Starbound. This is a great channel if you’re after fun, family-friendly Let’s Plays. Highly recommended. SethBling is known for his clever Minecraft inventions and creations, such as ingenious farms, devious traps, fun mini-games and advanced redstone contraptions. Some really fun series include the Minecraft TNT Olympics featuring real Olympic events to test your skills, and Minecraft Mega Blocks, where SethBling creates working giant-sized models of Minecraft blocks and mobs. There’s some mild violence and occasional naughty word when he plays multiplayer, but SethBling’s language is generally squeaky-clean! GoodTimesWithScar creates some amazing structures in his survival world, Scarland. There’s a huge transport system, a beautifully detailed house and a lovely garden! As well as his main tutorial series, GoodTimesWithScar makes lots of other Minecraft tutorials, such as how to build a modern-looking house and a tree farm and tree house. iHasCupquake is a gamer and YouTuber who produces a range of fun, upbeat Let’s Play Minecraft series that are popular with kids. For example, Minecraft Oasis uses lots of cool Minecraft mods to create a beautiful world in which she explores, builds an amazing jungle retreat, and even raises a family! Cloud 9 Minecraft is another entertaining series in which she plays in a sky-high world with her husband. These videos are clean, very well produced and a lot of fun to watch. She even does a Quake N Bake series where she shows how to bake game-related cake treats! Etho’s EthosLab channel is generally pretty clean, although there is some occasional swearing in multiplayer (mostly by other players) — you might want to stay away from some of the multiplayer vids made on the MindCrack server. EthosLab features a large Let’s Play series, as well as a series of tutorials that show how to build a wide variety of redstone contraptions. Check out the video above for a tour of Etho’s world, including his very nice house. Thinknoodles, like Stampy, has a lot of young fans and tries hard to keep his videos clean and family-friendly. He has an upbeat, zany style and his videos are generally a lot of fun. He tends to concentrate on adventure and multiplayer maps, rather than building. Check out Minecraft: The Missing Presents (a Christmas-themed adventure map), as well as Diversity (a “complete the monument” map with lots of variety). Generikb creates a wide variety of Minecraft Let’s Play series using a variety of mods, from the quest-driven Agrarian Skies mod through to the spooky-but-fun Attack of the B-Team modpack, which Generikb helped to produce (and which has raised tons of cash for the Child’s Play Charity to boot). Generikb models himself after Mister Rogers, so he specifically aims to be family-friendly. Some videos — particularly the multiplayer ones — might be a bit on the violent side for younger kids, and there is the odd mild curse word, but there’s nothing too nasty here. Last — but my no means least — kurtjmac produces a wide range of Minecraft Let’s Plays, including the legendary Far Lands or Bust, in which Kurt has, for over 3 years, been walking due west in his Minecraft world for charity! Sounds dull, but his commentary is what makes it work. Kurt also commentates on other kid-friendly games such as the excellent Kerbal Space Program. YouTube provides a Safety Mode that you can turn on in order to filter out dodgy videos from searches and suggestions. You can turn it on per browser on a temporary basis or — once you’ve signed in to your YouTube account — you can lock a browser into Safety Mode on a semi-permanent basis. While I don’t advocate spying on your child, it’s worth checking in every now and again to make sure they haven’t drifted off into unsuitable videos. YouTube is notorious for suggesting related videos at every possible opportunity, and inappropriate content is often only two or three clicks away. Also, if you’re logged into YouTube then you can check your kid’s viewing history to make sure they’ve been watching family-friendly stuff. If you get desperate — and this has happened a couple of times in our household! — you can block YouTube completely from your computer by editing your computer’s hosts file. In addition, many browsers have plugins and extensions that can block specific sites, and if you have a Mac you can use Mac OS X’s Parental Controls feature. Finally, if your kid uses a mobile device then there are handy apps such as Weblock available that can block YouTube entirely. YouTube’s Safety Mode lets you filter out most inappropriate videos from searches and suggestions. I hope this article has given you some options to help your kid learn about Minecraft in a safe, fun way on YouTube. Do you have any other ideas for kid-friendly YouTube watching? Please let me know in the comments below. Does your kid like to play Minecraft online, or would they like to start playing online? If so, don’t miss my article on family-friendly Minecraft servers! It’s packed with a great list of servers, along with tips for staying safe online. This is a fantastic article, thank you. My son is a young Let’s Player and has been wanting to do multiplayer Minecraft for a while. We will be applying to/joining several of these family friendly Minecraft servers. I also note your recommendations for ‘kid friendly’ Minecraft YouTubers. I would like to recommend my own son’s ‘kid gamer’ YouTube channel – http://www.youtube.com/EthanGamerTV. He has done several Minecraft Let’s Plays and we have a lot of others planned for the future. I have been getting that exact error for days and couldn’t figure out why. I’m guessing it’s because I missed out the /user/ part of the url. Funny, because it used to work. Maybe YouTube are being more strict on the use of the /user/ now so I will include it from now on. I realize I posted my message on the wrong article. I suppose the right way would have been to say ‘thank you for a great article’ on the actual ’11 family friendly Minecraft servers’ article and then posted my son’s YouTube channel here. Sorry if it’s caused any confusion. Ethan is always interested in other kid gamers/youtubers so if you wanted to share your son’s channel I will pass it along. Email me also if you want it to remain private. I’ve also scheduled a tweet later to thank you for the article. I’ve already added several to Ethan’s MC server list and we will be trying them out together when he has finished his home work (we live in Australia hence the time difference). Thanks Kevin. 🙂 We live in Australia too. My son doesn’t have a YT channel yet – he’s still learning how to make the videos. But maybe one day soon! My daughter watches Stampy and Iballisticsquid. I think you should have added TheDiamondMinecart to your list. Thanks for your comment Elaine. 🙂 TDM is very entertaining and my son loves it, although they do swear occasionally. Thanks so much for sharing this info. My daughter has become a huge fan of Stampy over the last month, and suddenly we overheard an f-bomb this morning to our disappointment. Our daughter was distressed when we said that she might not be able to watch them anymore because she’s enjoyed a LOT of inspiration and entertainment from him. So it was pleasantly surprising to see Stampy at the top of your list. We all (especially my daughter) are relieved to find that Stampy has taken this issue very seriously and is taking steps to ensure his videos are kid-friendly. It turned into a good “problem-solving family” moment thanks to your post. Oh bless you and all your informational skills! I have been searching both for this information and kid-friendly MC servers. I for one truly appreciate you gathering and disseminating this info! Thanks! Thanks for your comment Steph! I’m glad you found my articles helpful. And thanks again… this was super helpful. Thanks for your comment Kristin. My son watches TDM quite a lot and they are great, but he does swear a bit in his videos (or at least he used to – maybe he’s cleaned up his act!). Thank you Matt for this article and for posting these links! I really needed this article with family friendly MC youtube links! You’re welcome, Mama Bear. I’m glad you found the article useful! I’m glad you put the warning about Stampy, I have heard quite a few complaints about him from parents. He is very popular but there is no good way of filtering out his inappropriate videos on youtube. This is also a good resource for family friendly minecraft videos/info. Thanks for your comment Stewart. Yes it is a shame about those early Stampy videos. On the whole I think his videos are great. You shouldn’t forget TNTRyan. He is a kid gamer, and he is a very good YouTuber! He doesn’t say or do any bad things, so his videos are perfect for kids! This is a great list! There is a brand new channel I found last week, super cute and they even mention in there bio that they are 100% kid friendly! No problem at all! Let me know if you have any ideas to make the site better. Thanks! My 12-year-old son and I have developed a “how to” Minecraft website that is intended to be for kid-friendly videos across a variety of categories. It’s been a blast doing this with him and learning a lot about the game and wide world of Minecraft. They only cost me £15.00 each to set up and only have content on the named subject. There is no chat/comments and there is nowhere else to go. Has someone told You Tube Kids they need to pull those older Stampy videos and any others from the searchable content for the kids? I entered a complaint to youtube kids but not sure anyone is reading those. Great resources, thanks SO much. Any info on logdotzip? The “only one command block” videos? My 10 year old likes them but I was unsure. My son and I created a kid friendly Minecraft video website to showcase kid friendly YouTube videos and YouTubers. The site automatically filters out any non Minecraft Videos, does not have comments, and offers the ability to report any video that has content that might not be appropriate. We’re adding more YouTubers daily as we discover them! Surprised, not to see direwolf20, on your list, he is part of forgecraft sever team, he is very good at showing how to do stuff, and I have never heard him swear, if anyone start talking rude he yells out hay im recording , even slowpoke kids sometimes get online and play. His mod pack even has cool mods like carpenter blocks and decocraft so the kids be more creative. You can download the curse client for free, hope this comment is helpful for you guy’s and keep crafting. He records his battles Mineplex, Hypixel and other servers with his friends. There’s a lot of silly banter but nothing too rude or mean.